Distinctive orange KTM motorcycles have been gobbling up the roads and race tracks all around the world over the past few years and now it’s your chance to bring your KTM trackside. KTM New Zealand is thrilled to be able to offer the very first “Ride KTM Track Day” experience at Taupo’s fabulous Bruce McLaren Motorsport Park in two weeks’ time, on March 4. There is perhaps no other experience quite like it – Whether it is the sensation of holding the throttle wide open or the feeling of gliding through turns with a knee scraping the ground, there’s one thing for certain, you can’t help but come away from every session with a huge smile on your face and the feeling of euphoria. 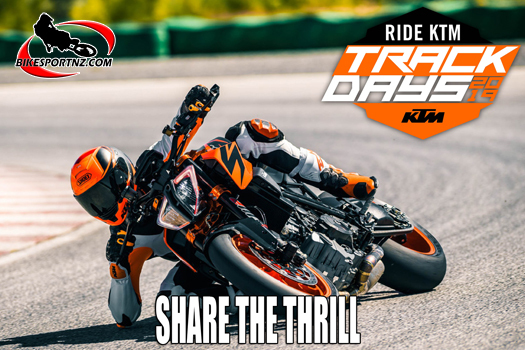 This Ride KTM Track Day is an event where you get to experience your KTM in a manner that differs from anywhere you may normally ride your motorcycle. You’ll be in a friendly, controlled environment, surrounded by like-minded individuals. KTM NZ extends the invitation for KTM owners to come and take part in this event where they will get a chance to experience the “READY TO RACE” roots that run deep throughout their motorcycle. Registration costs $95 and this includes a light lunch. Garage spots are $25 per bike, entirely optional. Gates open at 7am and the first bikes will be on the track at 9am. KTM’s aim is to provide the KTM enthusiast with an event that not only introduces Riders to the track but also to many other KTM owners. “We want to give KTM Riders the opportunity to go out and enjoy their motorcycle in a controlled environment where the only things they need to worry about are themselves and how much fun they’re having on their KTM. KTM Motorcycles are renowned for their Ready To Race capabilities and it’s our aim to ensure customers experience this first hand no matter what KTM they are riding,” said KTM New Zealand Event Co-ordinator Kyle Blunden. Group riding sessions will be offered in 15-20 minute blocks, sharing the track with other KTM Riders who are at the same or of similar riding ability. Groups may also be split up into machine capacity, but all KTM models are welcome, as long as they are fitted with road suitable tyres. KTM Genuine Spare parts, Powerwear and Powerparts are available for sale, with the staff from Boyd Motorcycles on hand to assist by answering any questions. Bruce McLaren Motorsport Park is located at 463 Broadlands Road, Rotokawa 3378, just 15 minutes’ drive from the Taupo town centre.